2000pts Imperial Guard vs. Blood Angels | 30mm Madness! 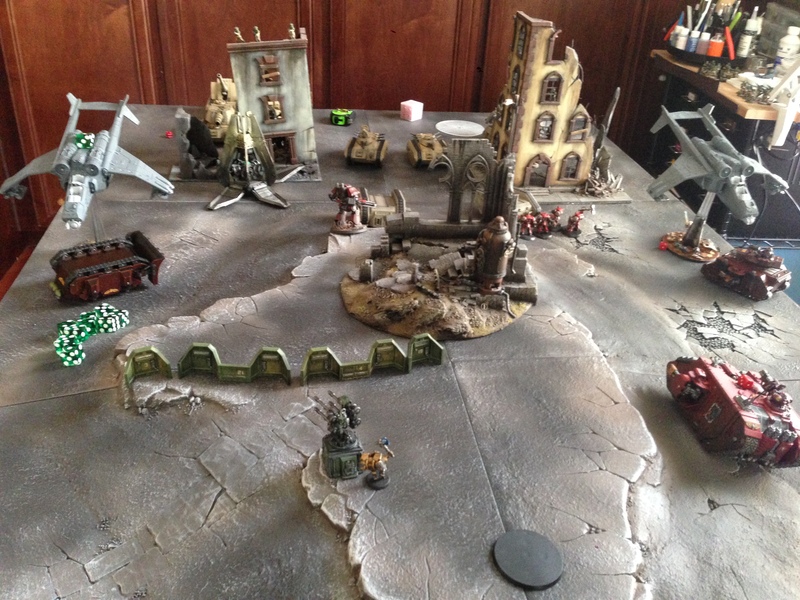 Had a fun throw-down with a good friend… I played my as yet unfinished Imperial Guard army, he played my Blood Angels army. The mission was ‘Crusade’ (objectives) and I eeked out a victory by one point. I held a single uncontested objective for 3 points, and he held none. Although now that I think about it he could have simply moved Dante to his backfied objective (he rolled ‘immovable object’ on the personal warlord traits table and was thus a scoring unit) and he would have won by two points. I’m still learning the rules so there was lots of looking things up… battle too probably 4-5 hours total. I think we hit 90% of the rules though (still haven’t done anything Psychic and no monstrous creatures, but covered pretty much everything else). Storm Raven, twinlinked lascannons, hurricane bolters, hunter/killer misiles, twin-linked heavy bolter. 2 Platoons (platoon command squad, 2x units of lasgun troopers). This entry was posted on February 19, 2014 by justinhardin. It was filed under Battle Reports, Warhammer 40K .